Creating art with several people at once can be a crowded experience. But not in MasterpieceVR. MasterpieceVR from Brinx Software mends the gap between design applications, like Quill and Oculus Medium, by letting users 3D sculpt and 2D paint in environments like an apartment, or a floating island above the clouds. Friends can even talk on a beach if they’d like, because MasterpieceVR is the first cross-platform, multiplayer enabled, painting and sculpting experience for virtual reality. This week I jumped into one of these VR environments with the CEO of Brinx Software, Jonathan Gagne, to test out how well they integrated multiplayer. I could have turned my private room into a searchable server, but instead, I used the menu on my controller to find Gagne’s public room. I spent more than an hour talking and creating with him, and yet we didn’t run into any networking errors or glitches. Allowing each person to manipulate their own view of a shared environment gets rid of that crowded feeling people have in real life. If someone is in the way, users can just move the creation. The phrases, “can you move?” or, “you’re in the way” just won’t exist online in MasterpieceVR. The undo and redo functions are also globally integrated, so if a friend deletes someone else’s brush stroke, both users can undo the deletion. This kind of collaboration can create a strange symbiotic feeling between users. I didn’t have control over what Gagne was creating, but each action he made inspired me to create something that I hadn’t thought of before. Take a moment to imagine two people making a tree like this. Someone could make the trunk, while another person draws a limb extending from that trunk. The original person could then zoom into that limb and add sub-limbs, while the second person paints leaves on top of the sub-limbs as they are being created. Each person could essentially “skip a step” in the design process, because one person could accomplish a step while the other prepares for the next. Artists would love the kind of collaboration that MasterpieceVR enables, and it’s fun to play with, but it’s also a great communication tool. 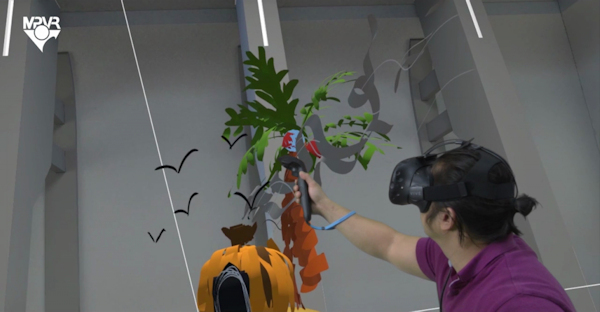 Game designers are already using tools like Tilt Brush to create prototype levels and directors could use MasterpieceVR to accurately explain how they want their scene to unfold. Besides its multiplayer capabilities, MasterpieceVR comes with 11 regular and animated brushes like the ones you’d find in Tilt Brush, including an interesting water brush that warps the view of everything behind it. You can change the size of the brush with your thumb, and even move or resize each individual stroke after it’s been placed. There are some drawbacks though, for instance, the thickness of a brush can’t be affected by the trigger button, and there currently isn’t a straight edge tool or non-shaded brush. As for sculpting, a user can add or delete clay with six primitives shapes, and then inflate, pinch, smooth, rough up, spin, or paint on the clay to their liking. They can even smooth out the color without affecting the sculpts form if it ever becomes pixilated. But like Oculus Medium, sculpts are confined by a box, which can be annoying to work with since the 2D brush strokes can exist outside of the box. The sculpting resolution can’t be increased either, which can make adding fine details to a sculpt difficult. Professionals may not want to use MasterpieceVR for their final drafts because of this issue, but for drafting out ideas with others, MasterpieceVR excels. Plus, this really isn’t a problem for anyone else using it for fun. After spending time with Gagne in MasterpieceVR, I can tell that a lot of the features people would want will begin appearing soon. There’s an update in the works that would expand the current two-person capacity limit for each room online, and the straight-line tool has already been developed, it’s just not in the current build. So if you’re interested in MasterpieceVR, it’ll be available on Steam for the HTC Vive and Oculus Rift in January. If you’re too eager to wait, you can visit their website to request early access. [See the original story for] a video summary of my time in MasterpieceVR with Jonathan Gagne for more details.